A ceramic knife set is a great product to give away to customers as corporate gift. Ceramic knives are seen as innovative products, improving the culinary experience of your customers. They are much more efficient in some ways then conventional knives. Ceramic knives are much sharper then metal or stainless steel ones and they don’t need to be sharpened. They are also sixty times stronger then conventional stainless steel knives. The unique properties of ceramic make it the best material for cooking utensils because the surface of ceramic knives are non sticky and any food can easily be washed away with a stroke of a cloth or splash of water. Ceramic knifes are much lighter then metallic knives, this product will offer significant advantages to your clients over traditional metallic knives. Other products can be made from ceramic such as a potato peelers and scissors. 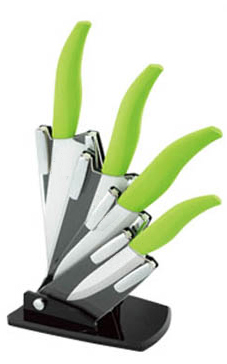 This knife set pictured here comes with four ceramic knives of different sizes, they are each used for different purposes. The set comes with an acrylic stand with glass on one side which displays the ceramic blade of the knives. In the set there is a Chef knife, a carving knife, a utility knife and a paring knife. Each set can be completely customizable with different types of knife sizes and with different number of knives per set. Some knife sets can be made for two-three products or more. The knifes pictures here have a rubber handle, this can be changed in terms of color or material, possible to have a wooden material to have a more classic knife look. The knife set can also come in a box set instead of a stand, the stand will be more practical for kitchen use. All of these products are entirely customizable as mentioned above. A logo or brand name can easily be printed on the handle or on the blade. It is also possible to print a logo or your company‘s name on the acrylic stand on the glass part and on the cover of the box set. All of these placements offer great layout to print logos and brand names. This is a great product to offer as a promotional product or for a GWP campaign. This kind of ceramic knife set can be offered with the purchase of a new fridge, a dishwasher or any kitchen appliances. Lots more high end Gifts & Premiums at the show this week.